Diodes are a very important component of most alternative energy generating systems – for example in PV solar panels they are used to stop energy being radiated back out into the night sky from the battery bank, and in wind turbine generators they are used to rectify AC into DC electricity. Most diodes are made of silicon because of its ease of processing and stability, however they have one disadvantage: a silicon diode has a forward voltage drop of around 0.7 volts. This means that if you had a 7.0 Volt rated solar panel charging a battery via a silicon diode, only 7.0 – 0.7 = 6.3 Volts would be seen by the battery – the remaining 0.7 Volts would be lost as heat in the diode. In a Bridge Rectifier the current passes through two diodes. Therefore the total forward voltage drop is up to 1.4 volts – a huge amount in low voltage systems, and even for 12V battery charging applications. A Germanium Diode (such as the 1N34 pictured above) will typically have a forward voltage drop of just 0.3 volts which means they are much more efficient. Older germanium diodes had a larger leakage of current at a reverse voltage, but now American Microsemiconductor and others supply a range of improved low current leakage germanium diodes. Diodes such as the most common 1N34A can cost as little as 5 pence each. It is not always easy to find germanium diodes as they are not a very popular item. One of the best ways to obtain them is to purchase vintage stock made available for sale on eBay. At the time of updating this article (January 2014) there were OA47, OA81, OA90, OA91, OAZ210, IS689, 1N34A, 1N42, 1N60, AAZ17, and AA119 germanium diodes all listed for sale – some new and some vintage / used. Click here to search eBay UK for germanium diode, or here to search eBay USA for germanium diode. While silicon diodes are resistant to the heat from soldering, germanium diodes can very easily be damaged. Therefore a crocodile clip or other suitable heat sink should be clipped onto the lead between the diode body and the joint to be soldered while soldering. An interesting article about the practical use of Germanium Diodes in a crystal radio set is here, and discusses the forward voltage drop of a selection of germanium diodes in real world testing. The OA47came out tops with a forward voltage drop of under 250mV (<0.25V). If you are unable to find a Germanium diode with a suitable current rating for your projects, the easy to find alternative is the Schottky diode. These are available in a huge range of different current ratings and sizes, and they have a voltage drop a little higher than that of Germanium diodes, but far below that of silicon diodes. 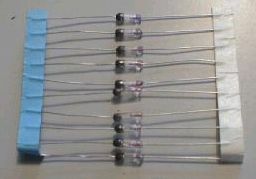 Pictured above for example are some 5 Amp Schottky Diodes priced at just under £4 for 20 delivered. Where even bigger diodes are required, we have often used the 30A blocking Schottky diodes pictured above. Click here for more information on these 30A and 40A Schottky Diodes.